If your brand/company has a women’s Star Wars fashion item/range you’d like to see featured or reviewed on The Kessel Runway, please get in touch with us via our contact form. The Kessel Runway website (www.TheKesselRunway.com) has broad international reach, averages 2000+ unique visits per day, and has a comprehensive associated network of social media installations. We have worked with companies to publish new product announcements, written featured reviews about supplied products, interviewed product designers, and work collaboratively in other ways to keep our audience up to date with their product range. To read more about different ways (and the benefits) of working with an influential blogger, check out this article from HubSpot. We have, and are always willing to sign non-disclosure agreements with companies, so we can work closely with brands in advance of product releases to develop articles/announcements that respect embargo dates. Why work with The Kessel Runway? Although there is a growing number of sites and pages catering to many aspects of “Geek Culture”, The Kessel Runway is unique in its focus and specificity. 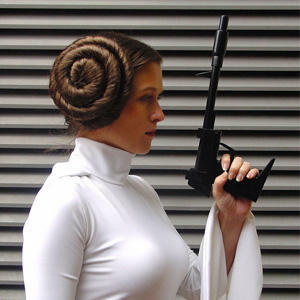 Consequently, our audience is made up exclusively of fans and purchasers of women’s Star Wars apparel and fashion accessories, both within North America and internationally. We support this targeted audience through both our published content and managed social communities (Facebook and Pinterest groups). We pay particular attention to the SEO of our articles, and enjoy a lot of new visitors hunting for both general and specific Star Wars fashion news and reviews through search engines. All of our feature content is permanently and freely available online (we do not use fee-for-content systems like Patreon). We work hard to keep our audience fully informed about the breadth of Star Wars fashion products available. In order to assist with informed purchasing decisions, our feature reviews include comprehensive analyses and photo galleries of details (typically in the order of 15+ images per feature review product), as well as sizing information (we frequently get direct queries about the sizing and other features of various products currently in the market). The Kessel Runway can offer a number of opportunities to support designers, manufacturers, and retailers. The following are the main types of relationships that we can provide, each of which can be tailored to cater to your specific needs, and to optimize the benefit to both companies and our fan audience. Featured product reviews. Items provided to TKR for review are comprehensively photographed and reviewed systematically to describe all aspects of the product – this information is distributed through multiple channels to female Star Wars fans all around the world. We find that the detailed analyses and imagery contained in our website reviews significantly influences purchase decisions and contributes to a positive shopping experience. Provided review items are also re-used over time in subsequent photo-shoots for social media images and other opportunities. Advance/pre-launch product preview coverage. We welcome advance notification of upcoming product releases that we can share (with embargo dates taken into account), including images to entice our keen audience. Product release reports. As soon as your product is available for purchase online or in stores, we can get word of that availability out to a broad base of potential customers. If this information is supplied in advance, we can publish such reports more efficiently and promptly. Designer/manufacturer feature interviews. Our readers have an interest in the behind-the-scenes aspects of fashion design and production, and interviews can increase engagement with a product or brand. If you have someone available on staff who is involved in the design of your products, we can send succinct, easy-to-answer interview questionnaires by email that we can incorporate in to feature articles promoting your company.